In highly regulated environments such as the pharmaceutical industry, integrating industrial separation equipment into the manufacture of pharmaceutical preparations ensures that product quality and strict FDA hygiene standards are maintained. One particular manufacturer produces a pharmaceutical filler known as an oxygen therapeutic (OT). The newly developed powder product, sometimes referred to as a blood substitute, is used to improve the oxygen content in blood and is added to an array of pharmaceutical formulations such as medications, creams and ointments. A key step in the manufacturing process is to segregate the OT product into different particle sizes. It is crucial for the separation cuts to be accurate and repeatable, to meet each end-customer’s exact specifications. By working closely with Russell Finex and conducting extensive machine trials, the customer was supplied with a Finex Separator™ to separate the pharmaceutical powder in to four different particle size fractions. The Finex Separator™ is a high performance round separator, that provides increased capacity, improved product quality and easy cleaning between product batches. The separator can be installed with up to 4 sieve decks, so that powders can be separated and graded into 5 different size fractions in one pass. The Finex Separator™ offers measurable operating benefits over traditional spring mounted separators, such as accurate particle size separation and increased separation efficiency. After formulation, the pharmaceutical filler powder is transferred by a vacuum conveying system to the Finex Separator™. In order to meet specific requirements, several modifications were made to this vibrating round separator. The 30-inch diameter unit was supplied with three modified open decks (rather than the typical intermediate decks), to provide precise multi-cut separations of 300 microns, 100 microns and 50 microns, in one single pass. Because the pharmaceutical powder tended to float above the separator screen due to its very low bulk density, two Russell Gated Outlets were fitted to the bottom two separator decks to keep the product on the mesh screen for as long as possible. The Russell Gated Outlet™ features a pneumatically controlled outlet which directs the powder flow away from the separator oversize outlets to ensure that the product is screened efficiently. The product flow device is ideal for applications where there is very little oversize or when the product has a tendency to discharge too quickly resulting in loss of good product. Finally, to reduce product leakage and dust, the separator outlets were fitted with BFM® fitting flexible connectors. The pharmaceutical grade connectors eliminated good product loss by allowing the separated product to flow directly into bulk shipping drums, as well as preventing contamination of the product and the plant environment. Russell Finex has been the global leader in separation technology for more than 80 years, with an established expertise in solving difficult screening and separation problems for customers around the globe. 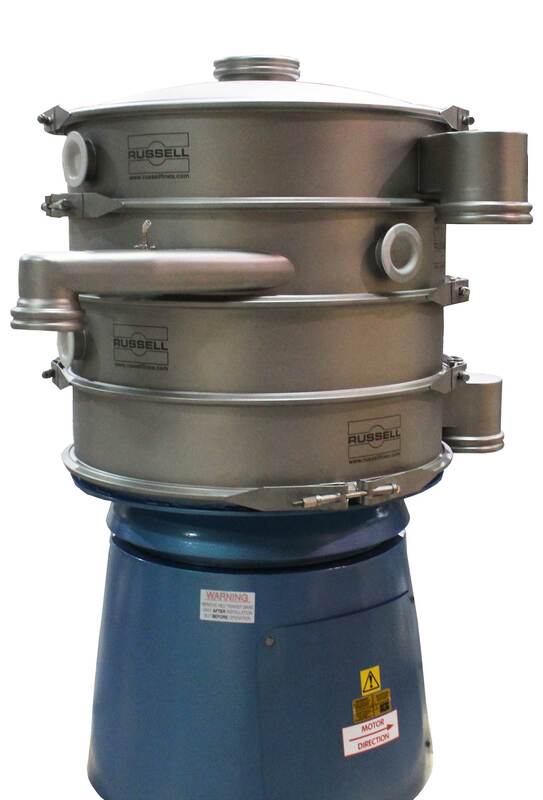 Contact Russell Finex today for a custom sieving solution, designed for your unique application.